"Dito po sa Gawad Kalinga ang first time kong maranasan makapag-volunteer. 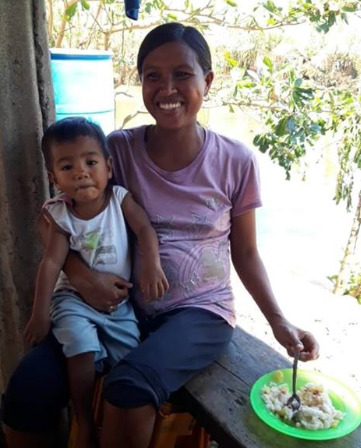 Masaya po sa pakiramdam dahil habang kami po ay tinutulungan ng Gawad Kalinga ay sabay na rin po akong nakatutulong sa aking sariling barangay." "The feeding of the 5,000! Thank you to all the Nanays (mothers) and the men from the three barangays for volunteering. The Sangguniang Kabataan (youth) was the strong arm of Team Gawad Kalinga in cooking, lifting, distributing, and an endless source of jokes and stories! 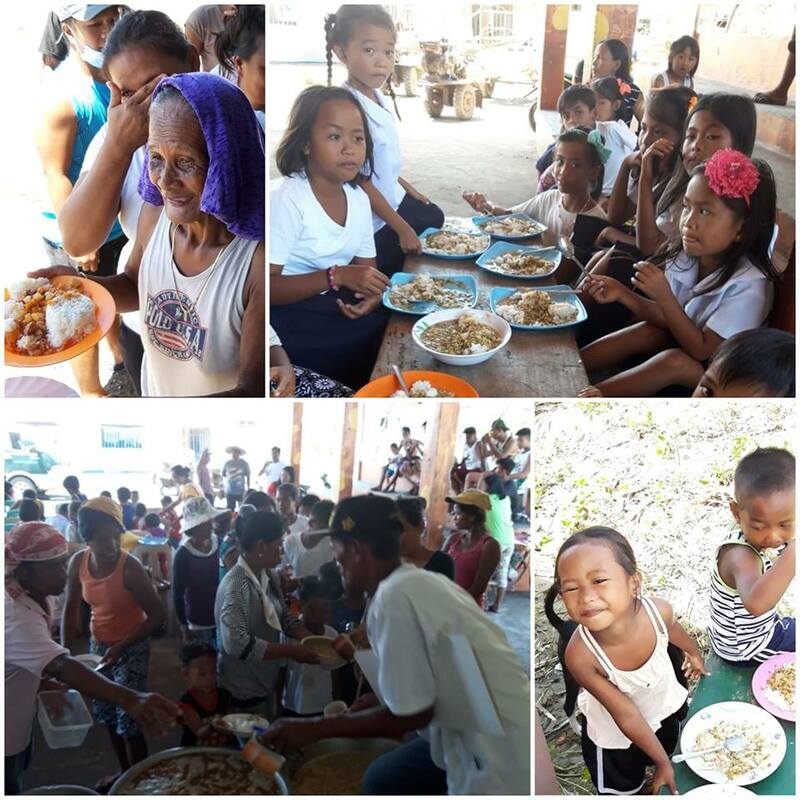 Bayanihan in action, answered prayers, "busog smiles from the little ones," silent gratefulness from the parents. 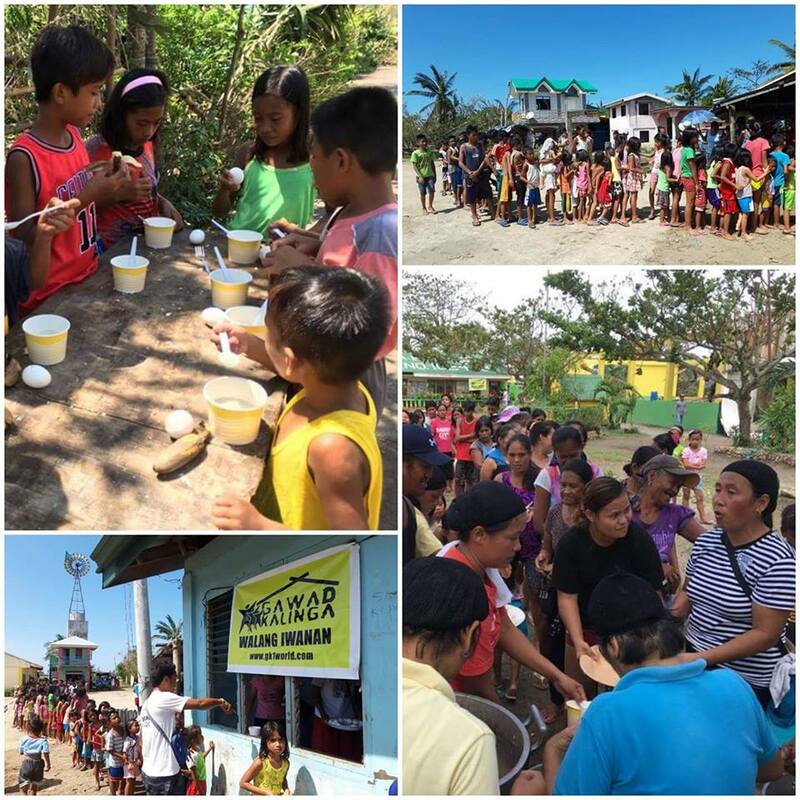 A palpable sense of curiosity from the communities why Team GK travelled so far to a place where everyone is a stranger to serve them hot meals and asked nothing in return... a crazy bunch of kababayans just happy to care without counting the cost... Walang Iwanan means walang gutom." "Thank you for sharing! Your ₱15 matters. 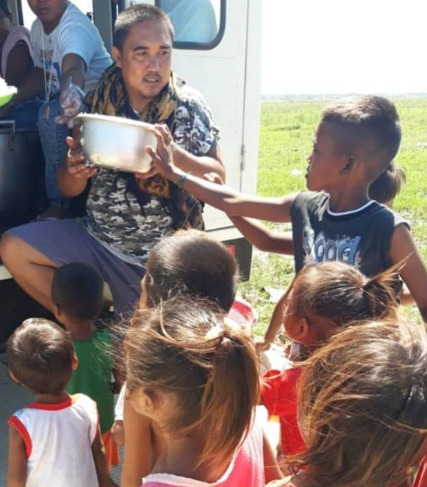 3,000 meals were served today in two barangays in Aparri, Cagayan. "We saw kilometers of electric posts leaning close to the ground rendering several towns still without power. We saw families fixing their already dilapidated houses using the same dilapidated materials. But what was most revealing was the reality of hunger and a sense of hopelessness among the farmers. Team Gawad Kalinga will focus on three barangays in Aparri, Cagayan. 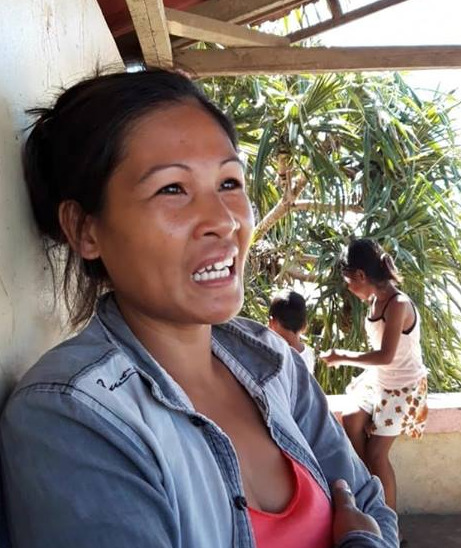 FARMING: Help 100 poorest farmers per barangay. We will need ₱30,000 per farmer from planting to harvest. 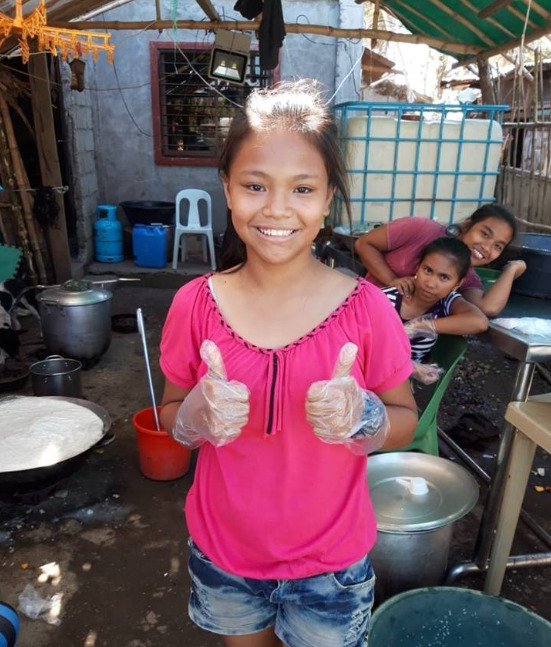 FEEDING: Feed 5,000 persons the next 7 days at ₱15 per meal. Typhoon Ompong has left the area. 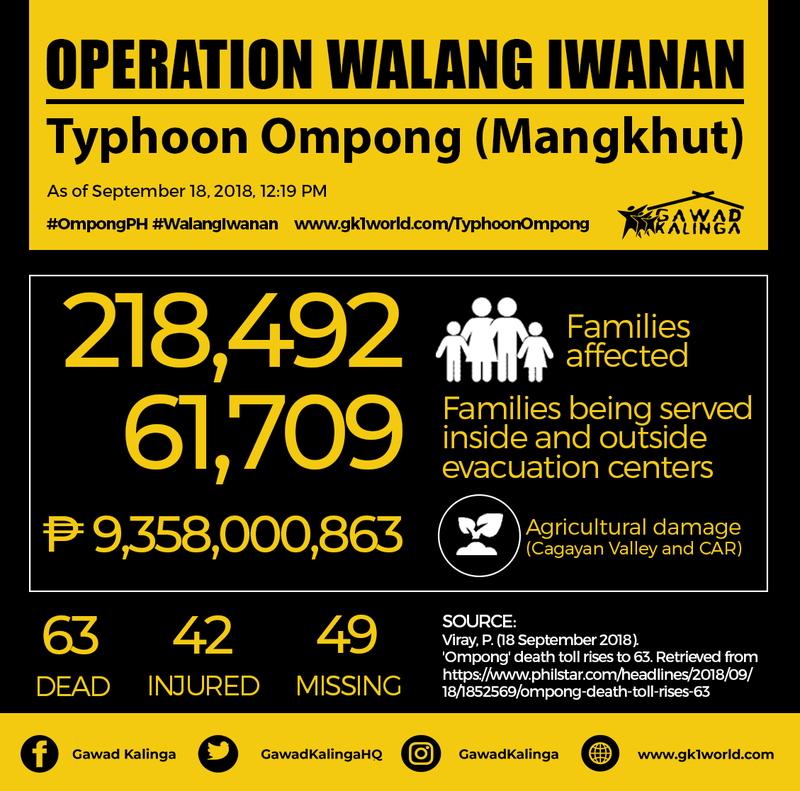 The tragedy that Ompong revealed like every typhoon that hit our country: POVERTY. The challenge to #endpoverty is epic, but a courageous act of kindness can end it. "First to serve, last to benefit means Walang Iwanan. 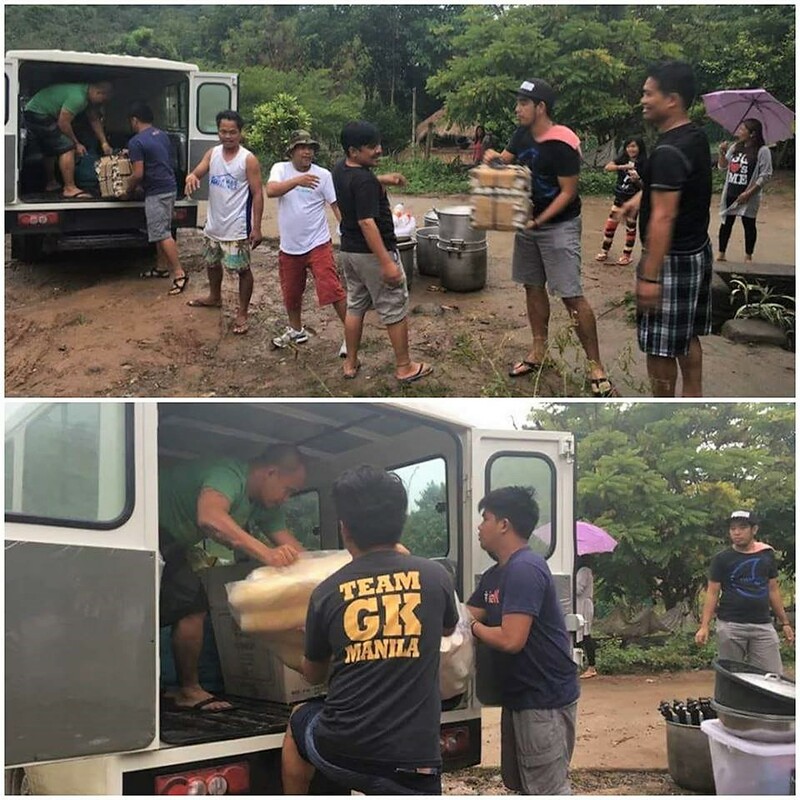 Team GK in Aparri, Cagayan serving hot meals to several hard hit barangays. 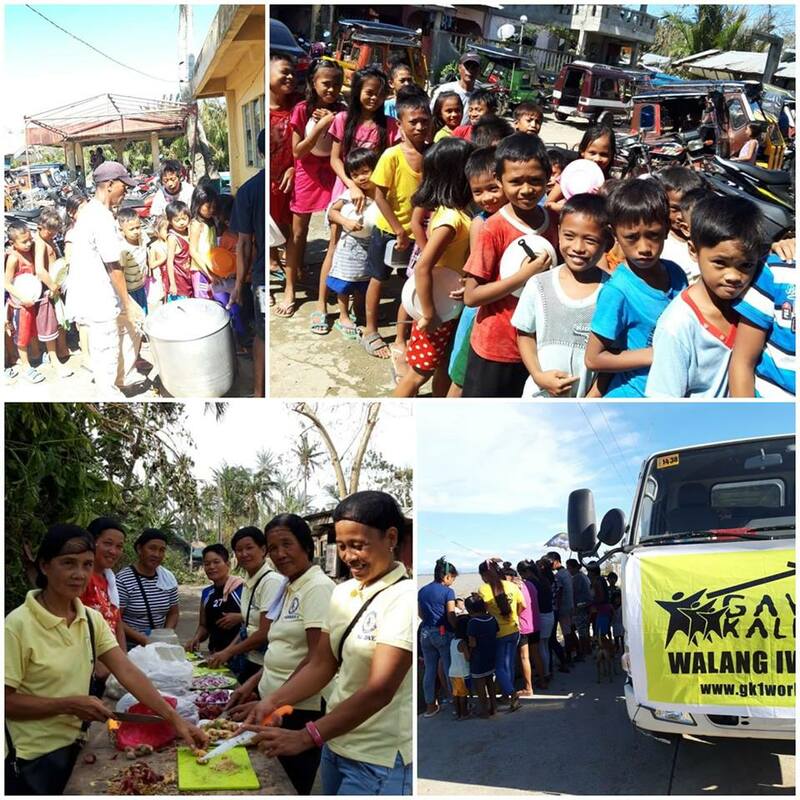 The hot meals are the first relief to arrive in all of the barangays that Team GK served. I am with the second team on our way to Aparri to organize a plan beyond relief. Will share the plans tomorrow evening assuming we have data connectivity. The scale of the needs are almost endless and exponential but every act of kindness big or small is special because it's always personal for both the giver and the receiver. Maraming salamat sa tulong ninyo." Hard boiled eggs and boiled bananas will serve as dinner for 300 kababayans of ours who were displaced by Typhoon Ompong. Not a five-star meal but certainly cooked with an all-star team of volunteers who braved the storm to deliver hope in each meal! 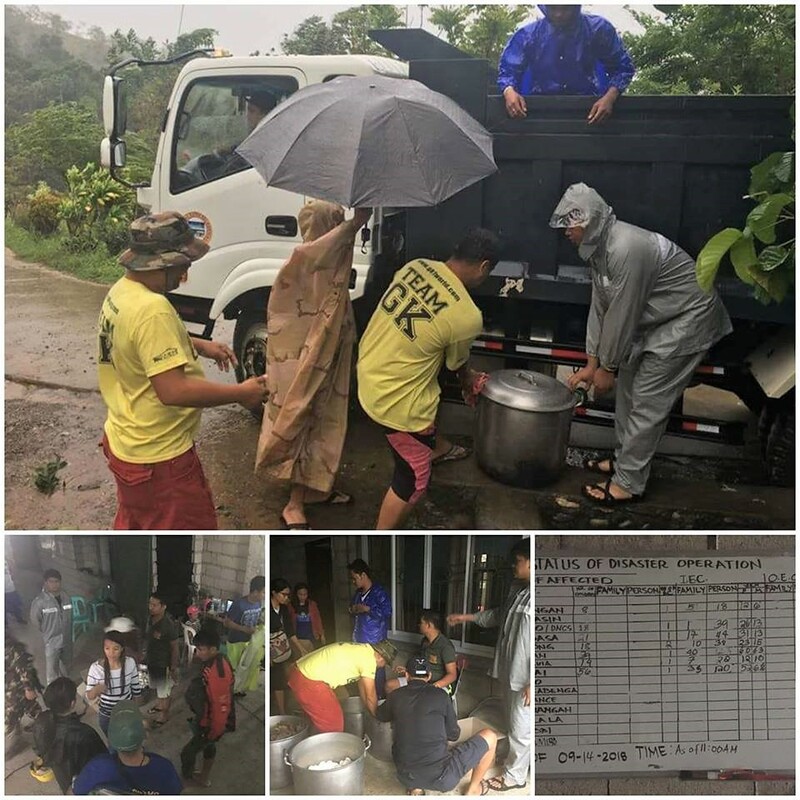 The brave bond of brothers and sisters of Team GK led by Anthony Adduru are now in Dupax del Norte, Nueva Vizcaya and has established our staging area for our kitchen. They will wait out Typhoon Ompong in the GK Community. Let us continue to pray for the safety of our countrymen. I pray for the Lord to enable us to become part of the answer to the prayers of those in need. 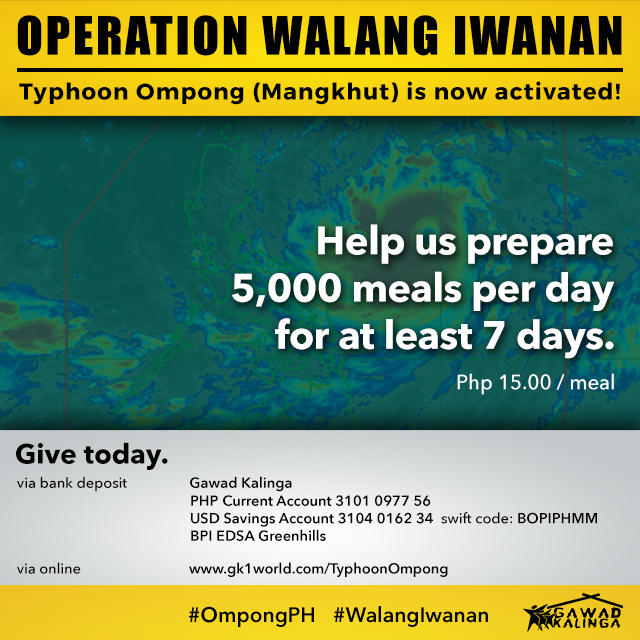 Operation Walang Iwanan for Typhoon Ompong is now ACTIVATED! Weather forecasts and government advisories are saying one thing: Typhoon Ompong should not be taken lightly. Gawad Kalinga is prepositioning our mobile kitchen that can deliver 2,000 hot meals per day in Isabela. Ready to be deployed to evacuation centers and barangays around ground zero right after the typhoon hits. Our objective is to serve hot meals to evacuees. We are praying for the safety of those families who will be directly affected, the first responders from private groups and government and in a special way, our Team GK who are on their way to establish our staging base of operations in Isabela State University. We will give updates as soon as it is necessary." 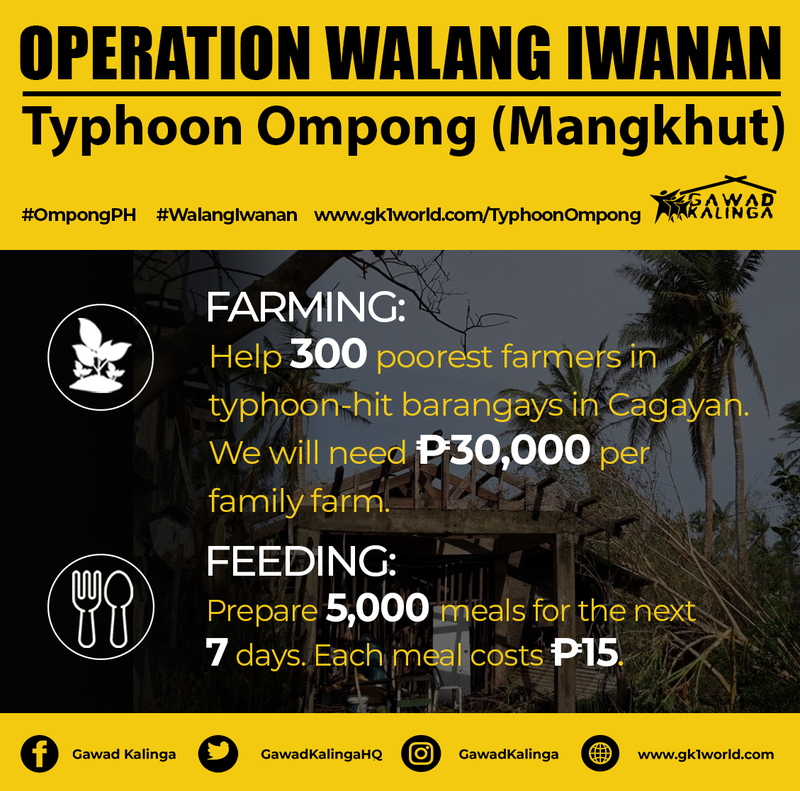 Help us raise funds for the families who have been affected by Typhoon Ompong. To donate, please put the amount below and click "Give Now."